Most fishing lures are designed to imitate some sort of prey, something on which the target fish normally feeds. Some lures are crawfish imitations, and some are bait fish imitations. That is not so with the Mepps spinner. These baits are purely reaction baits. That being said, they will catch fish when other baits fail. 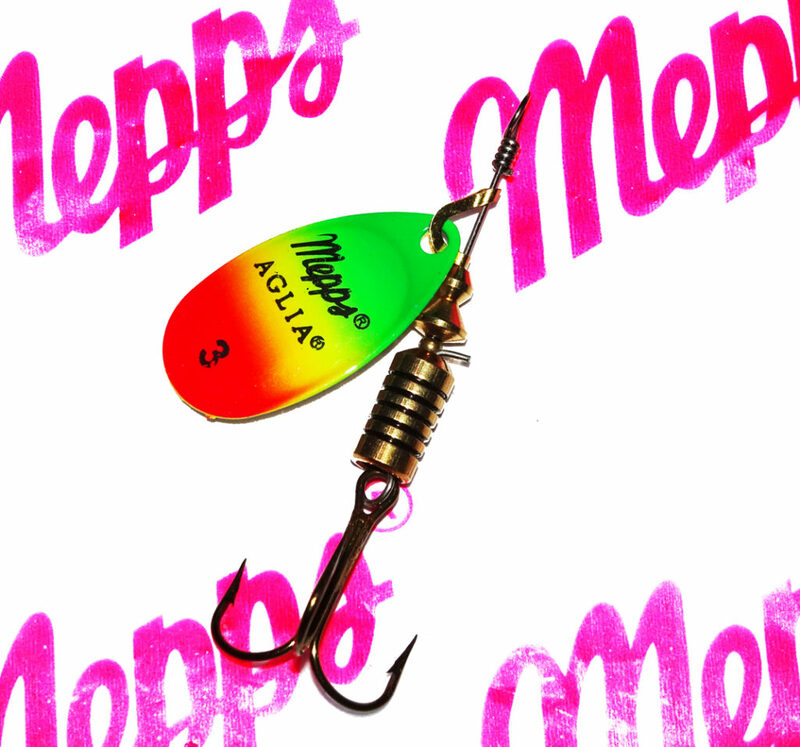 Mepps spinners are great lures for those times when fish are not actively feeding. Fishing them near brush, laydowns, or any other type of cover where fish may hide can bring strikes when the fish will not go for other lures. To a fish, it is something strange or interesting that is invading its territory. The fish will react, striking the spinner in defense or simply out of curiosity. In cold water or hot water, fish may not actively feed like they do when the water temperature is optimal. When the water cools, fish will seek out the warm shallows. When the water gets hot, they often go deep to find the right temperatures. If temps are not right, they feed less. But a reaction lure like a Mepps spinner can pull those lethargic fish out of the cover and make them hit. The vibration and flash of a Mepps spinner has long been known to entice those fish that simply cannot be put in the boat any other way. Mepps spinners come in a variety of sizes and colors. In all, there are over 6,000 combinations available. The# 00 and #0 size Mepps spinners are great for panfish and small stream trout. #1 and #2 spinners are the perfect size to entice larger panfish and stream trout to bite. This size is also good for smallmouth bass and smaller walleye. For walleye over 3 lbs. and largemouth bass, many anglers opt for a #3 or #4 Mepps spinner. In general, the bigger the bait, the bigger the fish an angler can target. However, that is not a science and not always true. After all, this is a reaction bait. If a 4-pound smallmouth is hiding in some brush and an angler slow-rolls a #2 Mepps spinner by it, it is likely it will dart out and take a swipe at it. There are many popular colors, but an angler should not get too caught up in the exact color. As with most baits, the darker or more stained the water, the harder it will be for the fish to see the bait. While Mepps spinners have good vibration, which the fish can feel with their lateral line, being able to see the flash from the bait is another attractant. The fish will first feel the vibration of the bait as it comes close. This will alert the fish that something is coming to invade its hiding spot. Next the fish will see the flash. That is when it will attack the bait. The most popular blade color is silver, which provides a very vivid flash. Next is gold, followed by black and fire tiger. Fire tiger is a popular color because it does well in a variety of water conditions. Anglers should not be afraid to experiment with different colors and weights until they find what works best in their given conditions. Having a box of Mepps spinners on hand is always a great idea, especially when fishing gets tough. Ultimate.Fishing brings a world of Fishing news and information to your mobile and desktop. Is farm raised salmon as healthy as wild salmon? For all you fishermen and women - Check out Ultimate Fishing for excellent fishing related content!